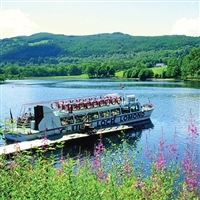 We return to Loch Lomond and the ever popular Winnock Hotel at this special time of year. This hotel is perfect for Christmas with its open log fires, beamed ceilings along with friendly service, fun and entertainment. Join us this year on an all inclusive tariff which includes full board and a free bar each evening. Monday  Our luxury coach will be waiting for your taxis and will depart Wiltshire to begin our journey north to Scotland with comfort stops on-route. On our arrival at our hotel we will enjoy a welcome drinks reception before dinner followed by Scottish entertainment and dancing. Tuesday  Christmas Eve. This morning after a full Scottish breakfast we head to Glasgow to maybe pick up that last gift before returning to the hotel for afternoon tea and pastries. Dinner tonight follow by entertainment and for those who wish to attend watchnight carol service there will be mulled wine and mince pies on your return. Wednesday  Christmas Day. Happy Christmas! A day to enjoy the seasonal festivities! Today includes a traditional Christmas lunch, follow by a visit from Santa. Enjoy Christmas cake this afternoon with the Queens Speech, Carol singers, an evening buffet followed by entertainment. Thursday  Boxing Day. After a full Scottish breakfast, join us for a scenic cruise on Loch Lomond, followed by a visit to the Loch Lomond shores complex to pick up a bargain in those Boxing Day sales. We return to the hotel for a delicious full afternoon tea. This evening we will enjoy a candlelit dinner with traditional ceilidh, a form of Gaelic folklore music and dancing. Friday  Time to bid farewell to Scotland and head south to Wiltshire and your waiting taxis after a wonderful Christmas in Bonnie Scotland. A modernised 17th century Inn, this family run hotel stands in the pretty village of Drymen, with its log fires, cosy lounges and high standard of cuisine, the Winnock is full of warmth and charm. All bedrooms have en-suite facilities with TV, phone and hospitality trays. Please note that although this hotel does not have a lift, ground floor rooms are available on request.